We’re pleased to present the six businesses that have been shortlisted for our Employee Engagement award, to be announced at our Birthday Party on Friday 9th February 2018. 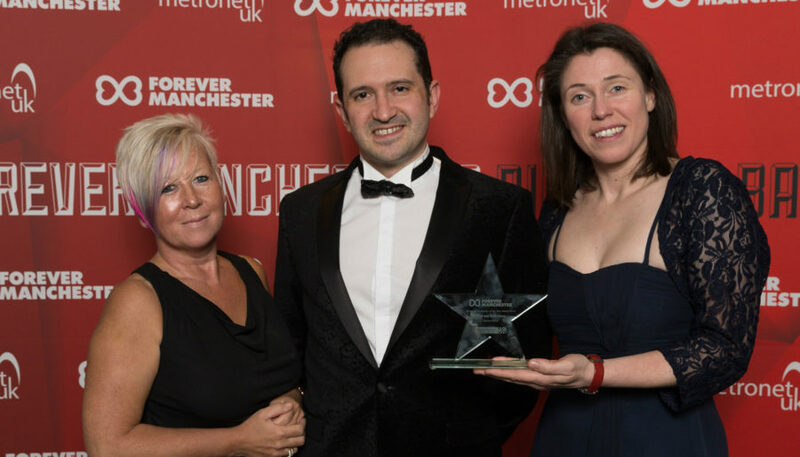 The Employee Engagement award is in recognition of an employer that has encouraged and engaged with its staff positively to contribute to Forever Manchester and local communities; enhancing employee opportunities by raising funds, donating time and resources and helping to raise awareness of Forever Manchester. The Employee Engagement award at this year’s Birthday will be sponsored by Manchester Building Society. Formed in 1922, Manchester Building Society has a long history of providing sound financial products. As a mutual, they are owned by and operated for their members, and they believe their mutuality enables them to offer high levels of service. They operate a streamlined organisation, based in the heart of Manchester with a network of agencies. Because of this they are able to keep their costs to a minimum and pass on the benefits to their members. They are a long-standing supporter of Forever Manchester and make regular, generous donations as well as fundraising for us. Auto Trader is the UK and Ireland’s largest digital automotive marketplace. Auto Trader sits at the heart of the UK’s vehicle buying process and its primary activity is to help vehicle retailers compete effectively on the marketplace in order to sell more vehicles, faster. They have a staff of over 600 people at its offices at First Street, Manchester. They launched the Auto Trader Community Fund in Spring 2016 and have provided over £50,000 in funding each year for the last two years. They have sponsored the Captain Manchester Award at the Forever Manchester Birthday Party for the last three years. The company promotes its CSR on screens around the building including their work with Forever Manchester. The Arena is the busiest music venue in the world! Manchester Arena has supported us for three years and during that time has donated over £80,000 worth of tickets to some of the most prestigious gigs in the UK. The donations allow us to raise thousands of pounds for our local communities, as well as allowing us to pass some of the tickets to people in our local communities. CDL, an insurance software house, is based in Stockport and has around 600 staff at its headquarters. The company celebrated its 40th anniversary this year and, as part of its celebrations, commissioned a poem from Tony Walsh having heard the This is the Place poem at Forever Manchester events. CDL has supported Forever Manchester for over five years. They launched the CDL Fund in 2012 and during that time has delivered over £200,000 in funding to over 100 grassroots community projects across Stockport. They also deliver in-kind support by donating reconditioned laptops and volunteer with groups they’ve funded as well as visiting them. Hologic is an international medical equipment testing and manufacturing company. For more than 30 years, they’ve pushed the boundaries of science to deliver clearer images, simpler surgical procedures, and more efficient diagnostic solutions. They pursue ‘The Science of Sure’ to enable healthier lives – everywhere, every day. Their UK office, based in Wythenshawe, has supported us for the last three years. Although they are a relatively small team in Wythenshawe, they have a formal charity committee and set themselves fundraising targets, and have come up with their own fundraising ideas as well as taking part in ours. Their company always matches the amount their staff raise and so far they have raised over £7,000 for Forever Manchester. ZenOffice, based in Chadderton in Oldham and operating across Greater Manchester, offers its customers a consultative sales approach and provides a range of business solutions, all from one place for all their office requirements. Zen Office has supported Forever Manchester for almost four years. They began their sponsorship of Captain Manchester earlier this year, feeling that it was a great way to help to deliver their brand as they love the spirit of Captain Manchester and what he stands for – spreading and encouraging kindness across Greater Manchester. Team spirit is great at Zen Office and they really give their all when participating in fundraising activities. AT Engine Controls has been at the forefront of engineering for over 50 years. They are extremely proud of their long-standing heritage and engineering pedigree. Throughout their history, their focus on high-quality engineering solutions has remained constant. Their sustained commitment has seen them develop into a global market leader in the fields of obsolescence management and the development of evolutionary solutions for process and mission critical systems. They work with some of the world’s most prestigious organisations, including Boeing, Rolls Royce and EDF Energy. They have supported us for three years and regularly take part in fundraising events, including Caketober and our FM Football 7-a-side tournament, as well as ATEC making regular donations to Forever Manchester.